Vinyasa....linking the breath with movement to create a moving meditation. Use the practice to find what you need, whether it is strength, stability, focus, or an activity to fill your schedule. Find your yoga. Change your life. Yin Yoga...this hour long class is the perfect opportunity to slow things down a bit. By using props and longer holds, the body is able to relax and release stored tension. Reach a new level of love with this chance to chill. Slow Flow…A slower paced class with a focus on breath, mindful movement and alignment. Appropriate for all levels. Sunrise Vinyasa...a flow style class with plenty of sun salutations to set the tone for a positive, productive day. Ashtanga…’a series of poses executed in a swift succession, combined with deep, controlled breathing’. 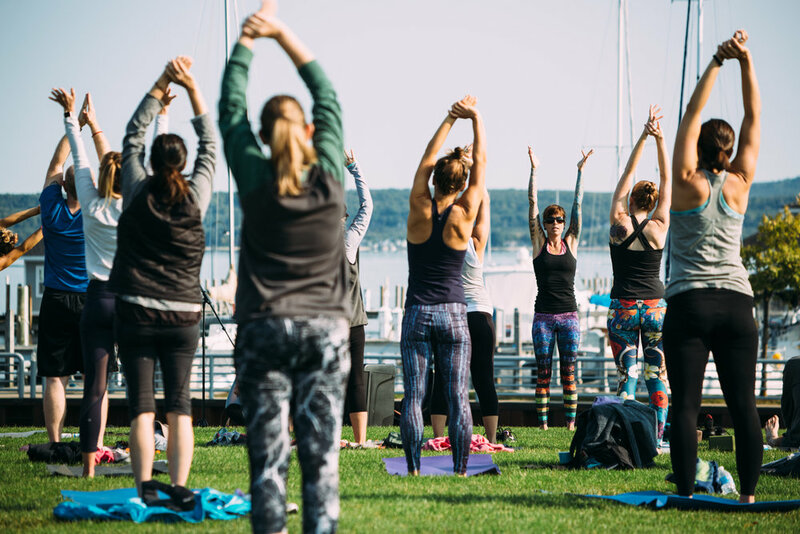 The same sequence will be performed every week to help build a personal routine outside of the studio, as well as strengthen the connection between breath and movement. All levels welcome. Sunday Service (slow flow...ish)...a mellow vinyasa based class with longer holds and Sunday morning swagger. Cave style Vinyasa…an hour long power class. Dark, loud and unapologetic. YINyasa…This 75 minute class starts with vinyasa based flow and winds down with yin…stretchy and chill. Accessible to all levels. Hatha…”willful; forceful”…a set of asanas meant to challenge the physical body and open the energetic channels within. Slower flows and static holds are the primary focus. All levels welcome. A great class for those looking to dive deeper into specific poses and proper alignment. Gentle Yoga…In this class, we will explore fundamental principles of yoga. This class provides an opportunity to grow your existing practice or establish a foundation to build a new practice from the ground up with safety & confidence. Topics will vary each week & may include various aspects such as pose break down, anatomy, alignment & energetic engagement, breathing techniques & pranayama, meditation, yoga philosophy, etc. Whether you’re a seasoned yogi, rebooting your yoga practice, or beginning a brand new one... All levels are welcome & encouraged to explore & grow together! Reiki...Private session...this ancient Japanese healing modality is focused on strengthening the energy system and reducing stress. Some benefits of Reiki include; pain relief, strengthening spiritual connection, mental clarity, improves sleep, relieves depression, improves self-esteem and self-awareness and many more.